Navigating the complex web of environmental regulations governing the maritime industry is about to become easier with the launch of Ocean Guardian, a new tool created by Total Marine Solutions, a Fort Lauderdale-based environmental products and services company. 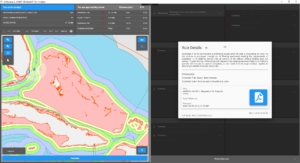 Ocean Guardian significantly simplifies a shipboard operator’s ability to comply with marine environmental regulations by taking the guesswork out of determining which regulations apply to a specific area. Ocean Guardian matches a ship’s exact location with its one-of-a-kind comprehensive global regulatory database to supply operators with the specific environmental regulations and rules for that location. Fully integrated with a ship’s Global Positioning System (GPS), Ocean Guardian is location specific up to .25nm, removing the need to review numerous manuals, guides and environmental matrices to determine which regulations apply. Ocean Guardian was developed with Brenock, a leader in cutting-edge software solutions in the maritime industry and a long-time business partner of Total Marine Solutions. “The complexity and breadth of the Ocean Guardian platform made it one of the most challenging projects we have undertaken in the last twenty years. It really is a game changer in the marine industry,” said Manus Walsh, who founded Brenock. Designed for the international maritime industry, Ocean Guardian’s database not only is updated by experienced marine professionals, but further verified and vetted by a third-party, independent maritime law firm to give clients the confidence of knowing that the information they have is the most up-to-date possible. Ocean Guardian will launch to the public at the Connecticut Maritime Association (CMA) Shipping 2017 Conference and Exhibition taking place March 20- March 22, 2017 at the Hilton Hotel in Stamford, Conn. A demonstration and question and answer session is planned for Tuesday, March 21, 2017.